Every now and then, you'll see a story explaining that the dates stamped on food don't really mean much -- that most of them are voluntary and aren't really related to health and safety. The reason for all the confusion is that there have never been any binding rules for most types of expiration dates, so manufacturers have been playing it by ear. That's about to stop, and consumer advocates say it will help Americans save money by not throwing out perfectly edible food. It should also relieve the pressure on landfills. Perhaps surprisingly, the new standardization isn't the result of new government regulations. Instead, the two leading grocery trade groups, the Food Marketing Institute and the Grocery Manufacturers Association, have come up with a set of voluntary standards that manufacturers and grocers will be encouraged to adopt. “Our product code dating initiative is the latest example of how retailers and manufacturers are stepping up to help consumers and to reduce food waste,” said Pamela G. Bailey, GMA president and CEO, in a press release describing the new standards. The new standards replace the current thicket of different date labels with two: "Use By" and "Best if Used By." "Best if Used By" is a subjective prediction of when a packaged food may start to taste a bit stale, but it is not a safety warning. Both the U.S. Department of Agriculture and independent health and consumer groups have been urging such action for years. 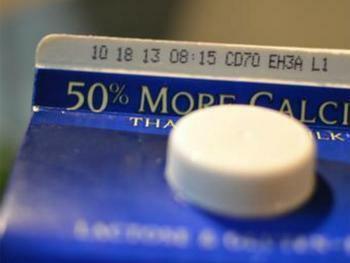 “Clarifying and standardizing date label language is one of the most cost effective ways that we can reduce the 40 percent of food that goes to waste each year in the United States,” Broad-Leib said, adding that the new standards will help consumers "make better decisions and reduce needless waste of food and money." You won't see the changes immediately. July 2018 is the official deadline and since the new standards are voluntary, not everyone will follow them. But major grocers, including Walmart, say they plan to get in line. It's also possible that the new industry standards may form the basis for federal legislation at some point, though in the current deregulatory climate, it doesn't seem likely that will happen anytime soon.